Y’all. The happiest thing took place this week… DTH got his hands on his sausage… grinder. His sausage grinder. What were you expecting? He got his hands on his sausage creator… the attachment that allows us to take ordinary chunks of meat and transform them into juicy sausages, casings and all (because the best sausages have the best casings… wink, wink, wink). It had slipped his grip several months ago, but now it’s back safe, sound and warm. To celebrate the reunion, we had a regular ole meat fest tonight, where we did, what else, but grind up my husband’s sausage. While Davey the Hubbers filled his hands with pork (do I even need to add the joke emphasis on this? I can barely type “nut butter”… you think I can write about sausage grinding? Because I can’t. 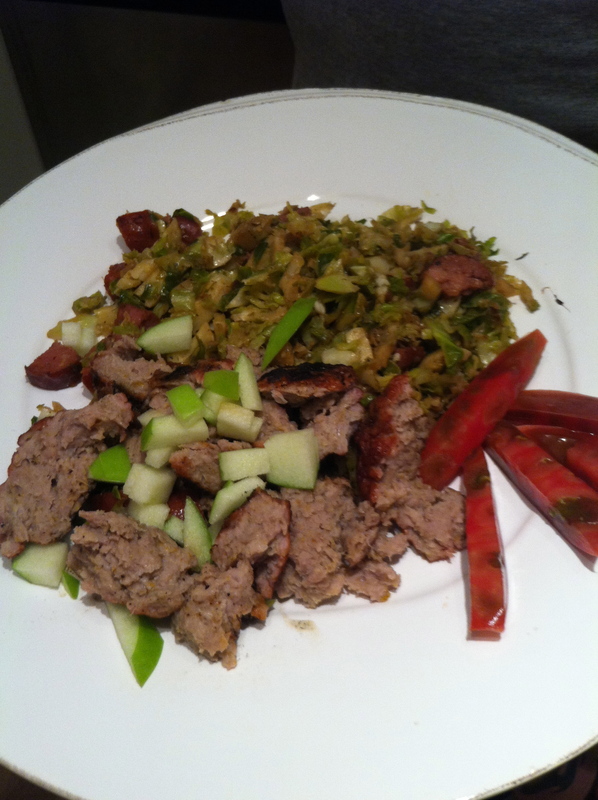 It’s like the sentences just flow out already innuendo’d), I got to work on the side dish… a peppery andouille sausage (what the hey… I just can’t resist and let him have all the sausage-y fun) filled shaved Brussels sprouts salad. As the most in sync couples tend to do, we came together and shared our sausage successes and heaped our plates high. As the dinner climaxed (DTH-GG’s addition, thankyouverymuch), we feasted and filled our respective tum-tums and decided the best course of action after such an evening was take to the blog, while we say on the couch giggling and satisfied. In a large saute pan or Dutch oven, heat 1 tablespoon of olive oil. When warm, add andouille sausage and brown quickly. Remove and set aside. Add additional 2 tablespoons of olive oil and shaved brussels sprouts. Add salt and pepper liberally to taste. Saute 2-4 minutes, then add 2-3 tablespoons champagne vinegar and let soften. Add andouille sausage back to pan and incorporate. Finish with a drizzle of blood orange olive oil and maple balsamic vinegar if desired. I blend all ingredients together and mix together for about 3 minutes until completely incorporated. At this point you can either do a patty or stuff the meat into pork casings. I didn’t have any casings on hand (imagine that!). I grilled them and while they were cooking I added some apple wood chips to the fire for a nice rustic flavor. Serve patties on buns with a squirt of sriracha, or on top of the shaved Brussels sprouts salad that Caroline outlined above. So there you have it! Cooking at home is very rewarding! It all starts with the desire to take the time to do it right! And you’ll never regret playing with sausage.